Hiring a minibus is the best way to travel to your chosen destination as a group; they are an extremely popular and method of transport and are utilised for many purposes including anything from fishing trips to airport transfers. 10 seat minibus hire will give a spacious and comfortable seating area for passengers and an excellent driving experience for the driver and whether you are travelling near or far a minibus is available to suit. A good benefit of the 10 seater minibus is the fact that it has the capability to carry a decent amount of people without having the price tag that comes with a larger vehicle. Finding a minibus with exactly 10 seats may not be as easy as you think to find. There are no 10 seater minibuses on the market that have precisely that many seats and companies advertising 10 seat minibus hire generally offer a 12 seat model. Minibus models jump from 9 seaters to 12 seaters and most companies are able to supply both of these models in their fleet. Of course a minibus with nine seats is going to be too small for a group of 10 people that makes 12 seaters the obvious choice. Hiring a 12 seat minibus has the benefit of being a larger vehicle, a group of 10 people can utilise the empty seats as extra space for luggage. Some companies may be able to provide a 12 seater based on your budget of 10 people meaning you are able to enjoy a roomier vehicle for a lower price. 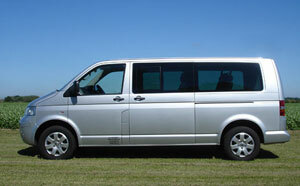 When booking 10 seat minibus hire it is important to know what you require the vehicle for. If you are in need of the vehicle for a weekend, week or longer then you will need to look for self-drive hire. If you are looking for hire for a short term measure such as an airport transfer then you will have both self-drive and with driver options available to you. Extras can be beneficial when you are travelling on long journeys and are especially handy when young children are on-board. Children quickly become restless during long trips and having a TV can keep them entertained seated. It is important to notify your chosen 10 seat minibus hire firm of any extras before a quote is given. The reason for this is for both availability and cost. Extras are likely to come at a price which will affect the overall quote. Safety is also important with 10 seat minibus hire. A 12 seat that has all forward facing seats and a three point seat belt system on all seats is regarded as the safest layout of a vehicle. Some companies are also able to supply a fire extinguisher and a first kit.